Please visit our PRODUCTS PAGE to register for training. Can I bring a computer into the classroom? No personal computing devices other than cell phones are allowed in the classroom for several reasons. 1. Space is very limited. 2. Significant distraction for the student and fellow students. 3. Integrity of student material and copyrights. Can I have a cell phone in the class? Cell phones are permitted as long as they are set to silent or vibrate. IACIS respectfully requests that should you have to take a call during an instructional block that you show common courtesy to others by taking the call outside. Excessive texting to the point of distracting others will not be tolerated. Students are expected to attend class in casual business attire. Shorts, jeans, mini skirts, flipflops wil not be permitted. Will I need a rental car at the Caribe Royale Training Event? There is a restaurant in the hotel and a few within walking distance however transportation will be needed for any weekend activities such as Disney or the other sights. Car pooling with someone is great way to meet your classmates and develop contacts from around the globe. Who is eligible to attend IACIS training? IACIS training is available to any IACIS member. There are two types of membership – regular and associate. Regular members consist of current or former members of law enforcement, current or former government employees, and current contractors supporting law enforcement or government agencies. Associate membership is designed for aspiring members of the computer/digital forensics community that support the mission and values of IACIS. What classes are offered by IACIS? Where are your training events held? IACIS offers an annual training event in Orlando, Florida the last week of April and the first week of May each year. There are generally 150-300 students who attend the “Orlando” event. A second training event, funded by OLAF, is held in Europe each year. The training event was hosted in Germany from 2007 – 2012 and has been hosted in Croatia since 2013. Occasionally, IACIS will offer specialized courses “on the road” if a volunteer to host the classes can be found. IACIS trainers are 100% volunteers and most are full time employees of law enforcement or government agencies. IACIS staff members and trainers are NOT paid to develop or teach our material. As a result, some IACIS members must take personal leave to attend our training event. This limits the number of times each class can be offered each year. IACIS attempts to maintain a 6:1 student/teacher ratio in each class. This ratio allows students to have plenty of one-on-one help during their training experience. Our staff and trainers have extensive experience in the field of digital forensic. All BCFE staff/trainers have earned their CFCE certification and are members in good standing. Why should I choose IACIS training? 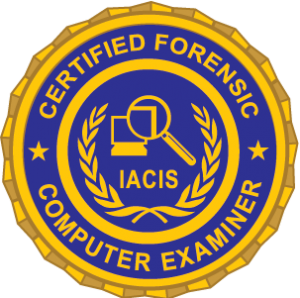 IACIS has been teaching computer forensics to law enforcement since 1990. The curriculum is vendor neutral and does not focus on any one forensic tool or suite of tools. IACIS does not endorse any hardware of software vendor and recognizes the need for many tools to successfully process digital evidence. IACIS is a non-profit organization and our training is the most reasonably priced training in the marketplace. We invite you to compare the price of our training to any other forensic training. The BCFE class offers two weeks of training for $2995. There is a 6:1 student/teacher ratio. Each student is provided a Windows based laptop computer, a hardware write-blocker, an external hard drive, a thumb drive, and additional software that each student gets to keep and take home at the conclusion of the training event. Additionally, each student is provided study material and entry into the comprehensive accredited CFCE peer-reviewed certification process that is one of the most rigorous and thorough certifications in the field. Who should I contact if I have additional questions about IACIS training? Feel free to direct your questions to training@iacis.com Please be patient as all IACIS “employees” are volunteers who normally conduct IACIS business during their evening hours from home.